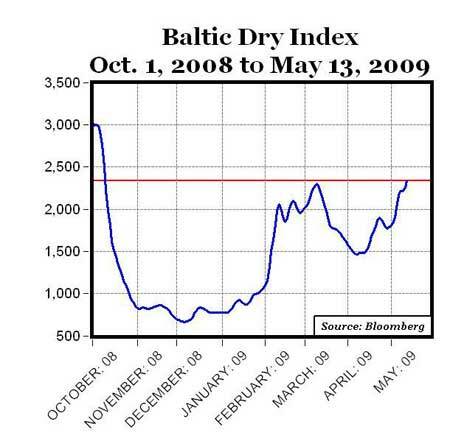 The Baltic Dry Index (BDI) closed above 2300 for the first time since October 10, and reached a 7-month high today of 2332. Over the last ten days, the BDI has increased by 560 points (+32%), over the last 25 days the index has increased by 869 points (+59%). February to April saw the largest ever amount of iron imported by China, including more than 50 million tons in April alone. That has largely fuelled the rise in the BDI, with shippers reporting brisk activity on the Australia to China route. Chinese buying activity and evidence of large-scale restocking, is fuelled by a spot ore price that is at its lowest in four years: the latest CIF (cost, insurance and freight) price for iron ore is $80 per ton, down 40% compared with last year. According to Brazilian iron-ore producer Vale, contracts with medium-sized steel mills, presumably state-owned, were the driving force behind the pick-up in sales in the quarter.